In 1991, we recognized a need in the market for a line of beautifully designed and expertly manufactured mailboxes. 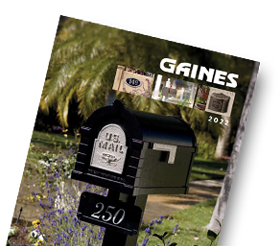 To meet this consumer need, Gaines Manufacturing designed and brought to market the Classic Mailbox Collection. It became an overwhelming success and provided the impetus for future mailbox lines including The Keystone Series® and The Wallmount Mailbox. In 2002, Gaines Manufacturing recognized another consumer need and again broke new ground by developing the world’s premier address plaque. The HouseMark® product line includes a family of high quality address plaques, post kits and solid brass numbers. As always, innovation is a trademark of Gaines products. HouseMark® Address Plaques feature a mistake-proof number alignment system. In December of 2012, Gaines Manufacturing announced the acquisition of the Janzer Company, and is now pleased to be the new source of an American classic — Janzer Mailboxes. Gaines has committed extensive resources and product know-how to enhance the design, functionality, and visual appeal of select Janzer products. The Janzer name has been trusted since 1986. Gaines is pleased to now make it part of the prestigious Gaines family of products and accessories. 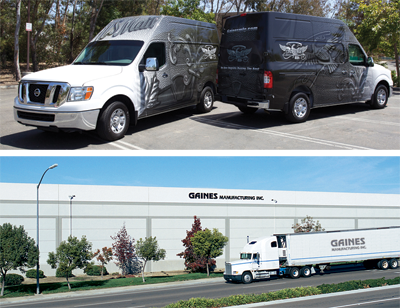 From its inception, Gaines Manufacturing has been committed to customer satisfaction. "I look at everything we do from a customer’s perspective," says Ted Gaines. "I like things simple, so we do things like including a drill bit in every HouseMark package so the customer doesn’t have to find, or even worse, buy one. I also want quality, so we never compromise on materials, finish, or workmanship in anything we make. It’s our formula for doing business and it will never change." Corporate office with a manufacturing and distribution facility is located near San Diego, California. Today, Gaines Manufacturing products can be found at premier retailers, decorative home furnishing showrooms, hardware stores, home hearth stores, and finer specialty catalogs around the country, and the list grows daily.